The combination of turmeric and honey is an incredibly powerful mixture that boosts immunity, fights bacterial and viral infections, treats inflammation, and soothes allergies. Raw honey has powerful antimicrobial, antiviral, anti-inflammatory, antioxidant, and antitumor properties, and it effectively kills strains of bacteria like E. coli, Salmonella enterica, and Staphylococcus aureus. Studies have shown that honey is more powerful than all antibiotics available. The European Journal of Clinical Microbiology and Infectious Diseases published a study which showed that honey was able to destroy every bacteria or pathogen they tested it on and its topical application fights infections, cuts and insect bites. Therefore, honey-based products could in many cases replace antibiotic creams on wounds and equipment like catheters. They confirmed that honey as an intermediate treatment can also prolong the life of antibiotics. Its consumption also helps digestion, improves the gut microflora, and many of the 180 beneficial compounds it contains improve gastrointestinal health. Honey improves cardiovascular health and prevents heart disease, due to the high levels of antioxidants it contains. Researchers also claim that it suppresses a cough even better than medicated cough syrups, and antibiotics. 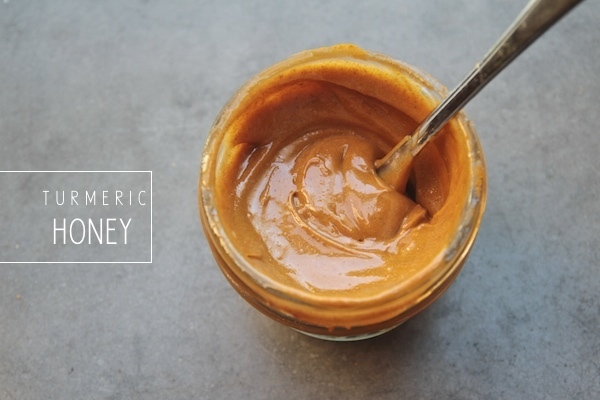 Honey eases the symptoms of allergies by boosting the immune system. It is especially effective in the treatment of allergic rhinitis (hay fever) and provides the same effects as a pharmaceutical antihistamine. On the other hand, turmeric also has potent antimicrobial and antifungal properties that destroy bacteria and viruses. It contains over 100 bioactive components, and its active ingredient, curcumin, has strong anti-inflammatory qualities. Studies have shown that curcumin is as effective as some nonsteroidal anti-inflammatory drugs (NSAIDs) like ibuprofen and aspirin. Moreover, the International Journal of Cardiology published a study that showed that curcumin helps protect against cardiovascular diseases, by reducing inflammation, preventing blood clots, and regulating heartbeat. It also improves digestion and stomach health and prevents chronic digestive-related conditions, like peptic ulcers, acid reflux, irritable bowel syndrome, and Crohn’s disease. Its anti-inflammatory effects protect the liver from alcohol damage, iron overdose and reduction in bile flow. The journal Molecules reported that curcumin offers a huge potential in the prevention and treatment of cancers. Yet, note that you should avoid it in case you have gallbladder issues or low blood pressure. One other study found that the Ayurvedic medicine made of turmeric and honey as two of the active ingredients stimulated the production and functionality of immune cells and in turn boosts the ability of the immune system to prevent diseases. This combination has an enhanced anti-microbial activity, as they act together against various bacterial and fungal strains known to cause infections in humans. This mixture can improve skin hydration and elasticity and lead to improved skin health. Turmeric and honey are also beneficial in the treatment of oral mucositis which occurs as a complication of cancer treatments. Mix honey with turmeric and black pepper. If you decide to use apple cider vinegar and lemon zest, add them as well. Keep the mixture in a glass, air-tight container for up to two weeks. Then, take a tablespoon of it daily to fortify the immune system and soothe seasonal allergies. In the case of a cold or the flu, take half a teaspoon every hour on the first day of the treatment, continue taking half a teaspoon every 2 hours, and on the third day, take the same amount three times daily. To treat respiratory conditions like lung issues, asthma, and bronchitis, take half a teaspoon three times a day. Note that you should keep the golden honey in the mouth until it is dissolved before you swallow it. You can also spread the golden honey on a whole grain toast and consume it for breakfast, add it to smoothies, or to a cup of hot water, and make yourself a cup of delicious and healthy tea.